MONDAY, OCTOBER 5, 2009 AT 7:00 P.M.
A. Approval of September # 2 Payroll in the amount of $44,169.00. B. Approval of Claims in the amount of $13,641.46. C. Approval of Minutes of the September 21, 2009 Regular Meeting. D. Approval of Tulsa Chamber of Commerce OneVoice Legislative Initiative. E. Approval of Graber & Associates, PC to be Architects for City Jail Project. 6. Presentation by Dr. Susan Babbitt pertaining to the Summer Reading Program. 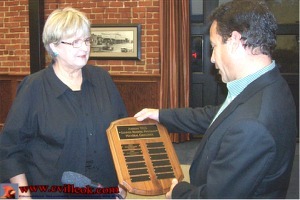 -- Dr. Babbitt presented the plaque (won by the Collinsville Library for the higest percentage of completion by Collinsville readers this summer) to Mayor Sallee for City Hall display. 7. 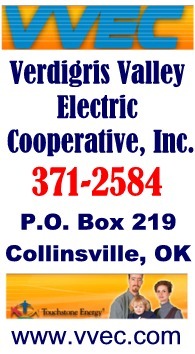 Discussion, consideration and possible action regarding lease agreement between the City of Collinsville and the Ward-Wiseman Animal Haven. -- severa options covered in lengthy discussion (which I left to check o the school board meet). I assume no action was taken, as several had asked for another offline iteration on the agreement before city action. 8. First reading, discussion, consideration, and possible action to adopt Ordinance No. 837, an Ordinance accepting, adding and annexing to the City of Collinsville, Tulsa County, Oklahoma, all that certain real estate being more particularly described as the Northeast corner of East 136th Street North and North 129th East Avenue and containing approximately 30 acres, providing that said real estate shall be part of the City of Collinsville, Oklahoma, and all persons residing therein, if any, and all property situated therein, shall be subject to the jurisdiction, control, laws and ordinances of the City of Collinsville, Oklahoma; directing notification, and declaring an emergency. -- First reading waived then annexation approved. 10. 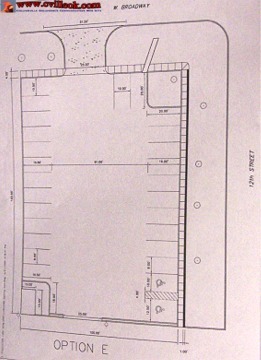 Discussion, consideration and possible action on parking lot design north of city hall. -- approved Option E (photo below) with ~26 parking spots, a Broadway entry/exit, no trees removed ... selected from 6 plans. Payment for the lot is budgeted in the current city budget. * Darling International has signed an updated discharge fee agreement. Darling has also dreged some ponds and added black mesh on the surface to reduce odor with fewer complaints recently. * GRDA customer conference Thurs-Fri in Tulsa. POSTED BY: Angela Long, City Clerk -- DATE: 10/2/09 -- TIME: 3:30 p.m.
A. Approval of September # 2 Payroll in the amount of $21,376.54. B. Approval of Claims in the amount of $83,641.78. Annexation: 30 acres at Northeast Corner of East 136th Street North and North 129th East Ave.